Figure 13.14. 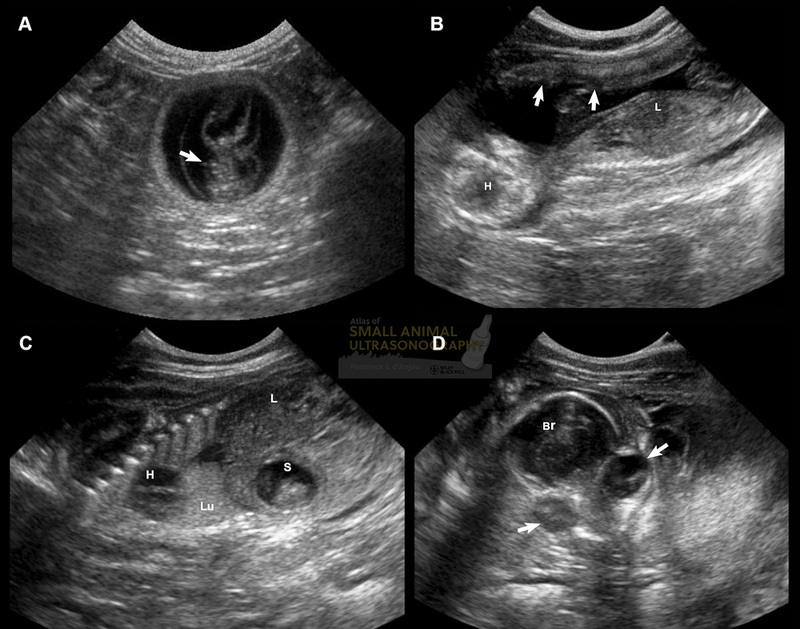 Progression of normal pregnancy in a domestic shorthair cat. A: Day 24. The embryo (arrow) is visible within the gestational chamber surrounded by copious fluid. B: Day 39. Sagittal image of the fetus with the head (H) to the left. Liver parenchyma (L) is visible. The placenta is in the near field (arrows). C: Day 60. Sagittal image of the fetus. The heart (H), fluid filled stomach (S) and liver (L) are easily visualized. The lung (Lu) is hyperechoic. D: Day 60. A dorsal view of the skull shows the brain (Br) and eyes (arrows).